01. Peacemakers ( Liz McComb) 03'45"
02. Oh When The Saints (Trad. arr. Liz McComb) 04'35"
03. Come Back Lover (Liz McComb) 05'19"
04. God Made a Miracle (Liz McComb) 05'33"
05. Silver & Gold (Liz McComb) 05'26"
06. You Ain't Christian Enough (Liz McComb) 03'43"
07. For Your Love Is Better (Liz McComb) 05'35"
08. By The Rivers Of Babylon (Trad. arr. 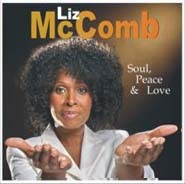 Liz McComb) 02'57"
09. Let There Be Light (Liz McComb) 03'23"
10. The Rich Man (Liz McComb) 06'02"
11. Remember Me (Liz McComb) 03'30"
12. Can't Nobody Know My Trouble (Liz McComb) 05'14"